A couple of weeks ago in a comment someone asked me to do a step-by-step of one of my journal spreads. It probably would have been better to have taken pictures as I went along, but I didn't. Maybe this will be of interest to someone. 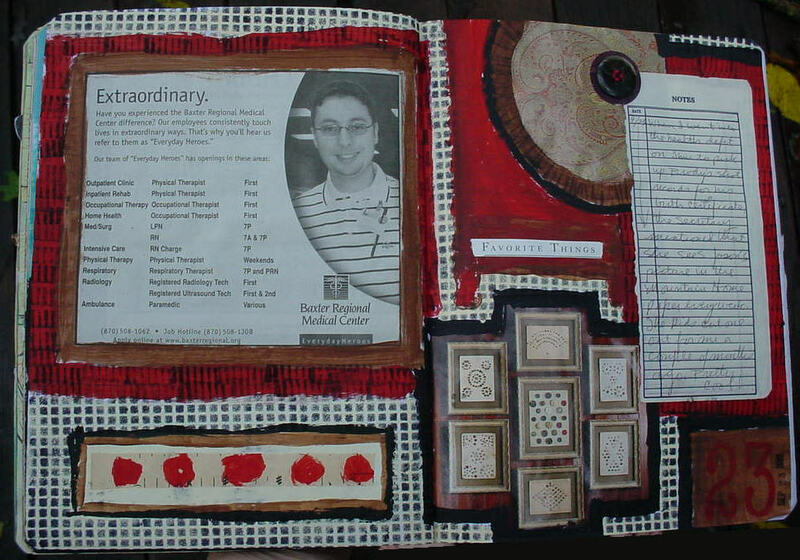 I posted the page recipe to CompositionArtJournals a few days ago. I'll put it here in a separate post. You'll see that I didn't follow it very closely. I was ready for some color. I decided I was in the mood for black, brown, red and white. I just needed a color photo to go with the scheme. On the floor was a magazine page with a great picture of buttons in frames hanging on a paneled wall. I had my three photos (sort of). I glued the clipping on the left page and the button photo on the right and decided that I wanted my note paper to sit on top of the paint, so I just picked a position for it overlapping the button photo. I used a small brush and brown fluid acrylic to paint a narrow border around the clipping. Then I did the same around the button pic with black. Then again around the clipping with some red paint mixed with brown to tone it down a bit. By this time I decided I needed one more photo, so it was back to my magazine. I found a great shot of circles of different fabrics. One paisley was perfect. I cut it out and glued it down behind where the note paper would go. My recipe called for three photos, but recipes are meant to be guides, not rules. I painted another border of the red/brown around where the notepaper would go and a brown border around the paisley fabric circle. Next was a third border, off white this time around the clipping. I decided to just finish off the bottom of the left page in white thinking I could add more paint over the white if I wanted to. I added a white border next to the black around the button photo and above the notepaper. Then a black border around the paisley and another black one in the lower right corner which I painted brown and added a stamped date in red/brown. 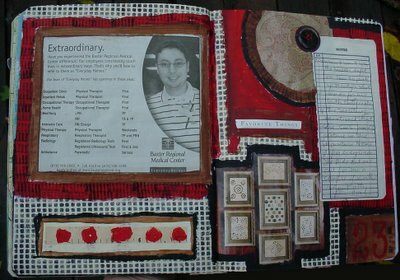 That just left the center portion of the right page which I painted brown at the bottom and red/brown at the top. I didn't like that so I smeared some red over the brown area. My recipe calls for stamping in the borders, so I picked out one of my favorite stamps which is just slice of an eraser cut with a serated knife. I stamped in black on the two red/brown borders. That made the borders really pop. I finally glued down the notepaper after I wrote on it. The big white space was really bugging me, so I glued a strip of paper from an old book of sheet music. Around it I painted two narrow borders, brown and black. It seemed to still need more color, so I painted five red dots. I thought these would work with the buttons. The page was starting to come together, but I still wasn't happy with all of the white. There was a piece of needlepoint canvas laying on my work table and I put it over part of the white border and stamped black ink through that. It looked great, so I stamped all of the white borders on the spread. Wow, much better! The last things I added were the strip of text, favorite things because it was laying on the table and seemed to fit; the circle punched brown paper on the paisley; a little bit of black next to the paisley to extend the line of black from the bottom of the page and a stamped date. I liked the way it looked, but then I got the idea to sew on a real button. I usually don't put many things like this in my journal because they tend to make it hard to work on the later pages. I'll probably be sorry, but I love the way it looks. I didn't notice until much later that the circle of paisley mimics the circular photo. I love it when things work out like that.